Occasionally, aluminum parts are polished too aggressively, resulting in burn through, as is the case with these 1965 Impala SS Cove Moldings. 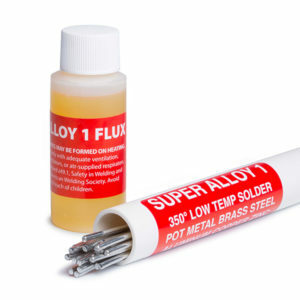 To repair this damaged aluminum part, grab your MuggyWeld.com Super Alloy 1 and a propane torch. Begin by dipping the rod into the flu and gently but quickly heating the parent metal. When the flux changes color, this is an indication that the parent metal is at the proper working temperature. Gently paint the rod over and across the hole. Notice the vertical position of the repair–customers often ask if this technique can be used with Super Alloy 1. The answer is, of course, yes. To finish the part, smooth out the solder with wood prior to sanding or grinding. Normally, you would not heat the flux or work area directly, but thin pieces quickly reach the 350 degrees F working temperature, so we opted for direct heating on this piece.